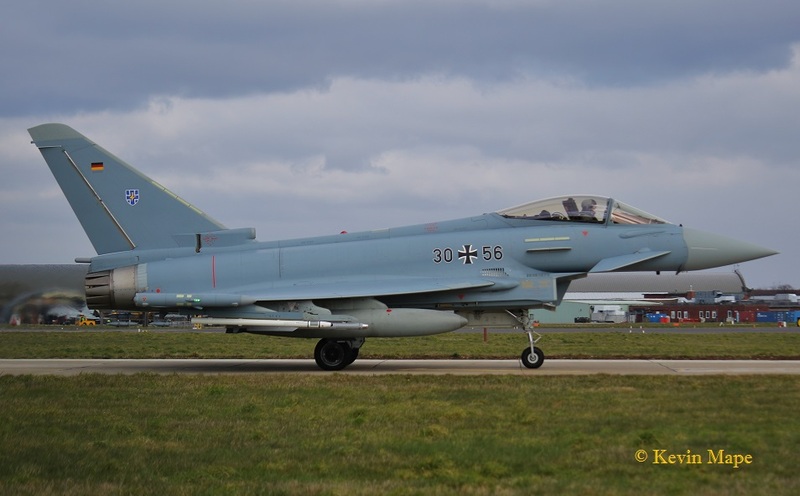 March is going to be a busy month with the arrival of German Air Force EF2000 Eurofighters of TLG 31 detachment from Wittmund with crew and ground crew from TLG 71 “Richthofen” also Whitmund early in the month for a three week deployment, This will be the first time Luftwaffe Eurofighters have operated from RAF Coningsby. 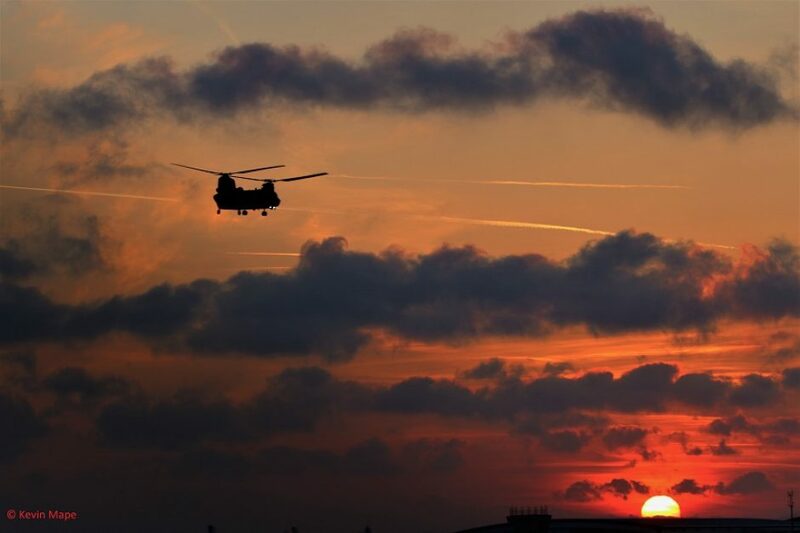 Those of us that have been watching the Trucks and Transall’s arriving to form an operating base on Sierra dispersal, TLG 71 will be operating with 11(F)Sqn during this deployment..
ZJ134/S/28-78Sqn marks/Merlin HC3 c/s “Kracken 1” – Mission. 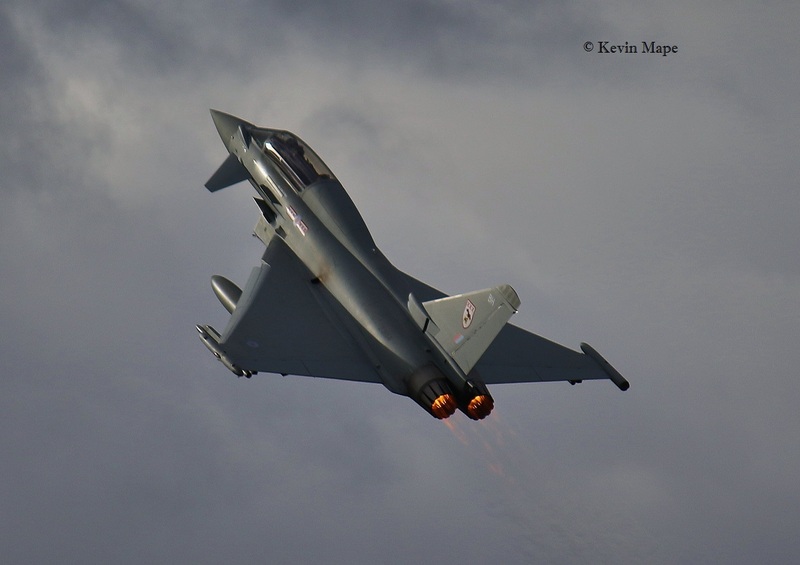 ZK333/FS/1(F)Sqn/Typhoon FGR4 – Engine runs on the ASP. XX278/RAFAT/Hawk T1 c/s “Red 9” – Overshoots. No.103/YT/EAT00.319/Xingu c/s “Cotam 1732” – Parked on the ASP. XX232/RAFAT/Hawk T1 c/s “Red 8” – Overshoots. 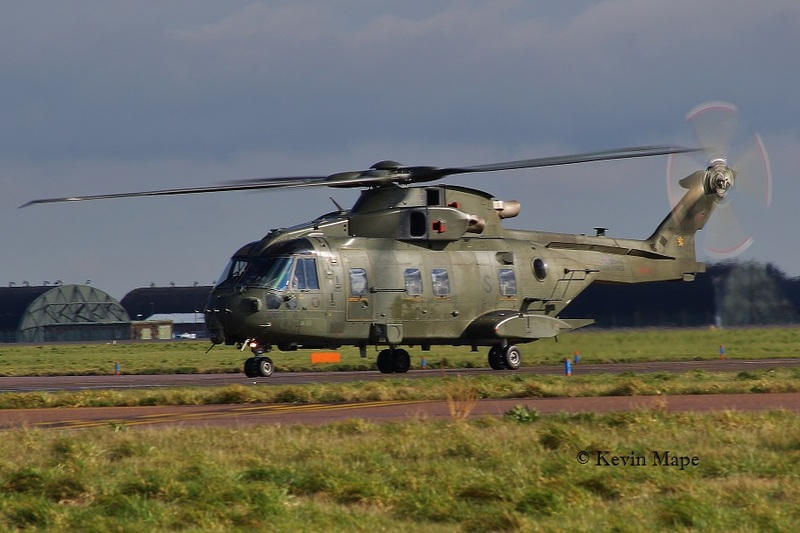 ZJ124/S/28-78Sqn marks/Merlin HC3 c/s “Junglie 432” – Departed. BBMF – P7350/EB-G – Engine runs. 2nd Wed Log thanks To Susie Matson & Zac Hinchcliffe. 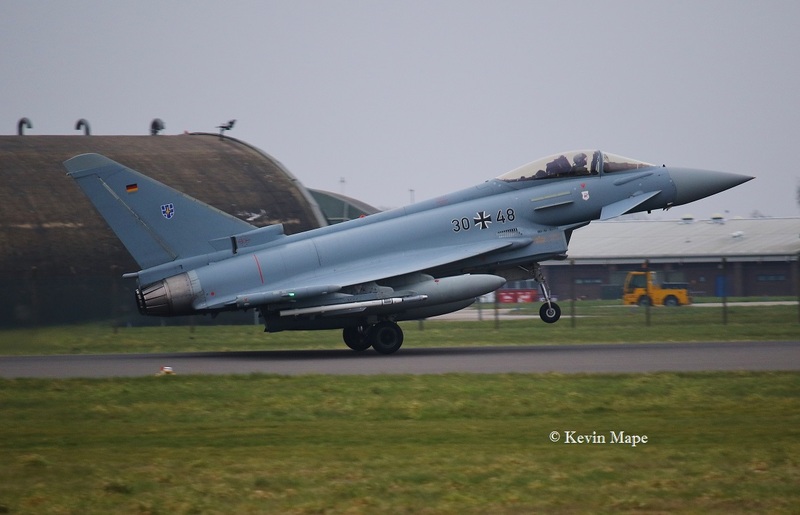 ZK301/D/1435 Flt/Typhoon FGR4 – To TMF. No.082/YG/EAT00.319/Xingu c/s “Cotam 1717” – Parked on the ASP. No.082/YG/EAT00.319/Xingu c/s “Cotam 1717” – Departed. 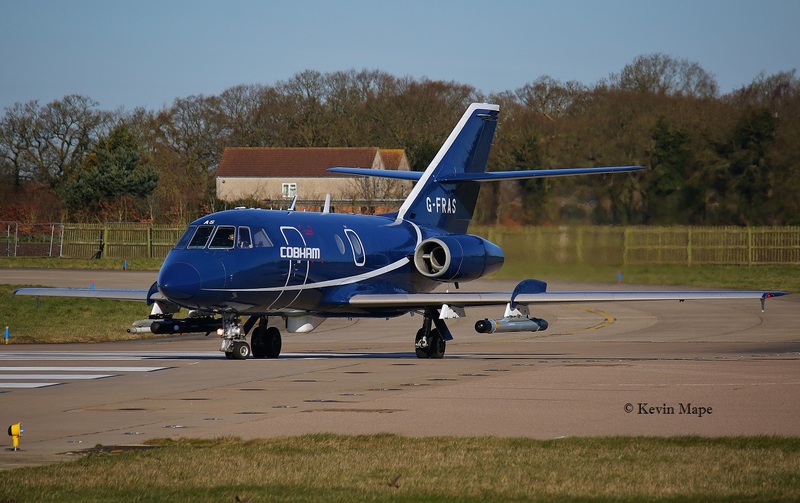 G-FRAS/AS/Cobham/Falcon 20 EW c/s “Rushton 98” – Departed. 4th Fri –Fire & Rescue exercise based around the fire dump. AM – Base closed to normal flying. Unloaded into the fire dump was a Islander Fuselage for rescue. G-LNCT/ Lincs-Notts Air Ambulance/MD900 explorer. -Landed in the Fire dump area. 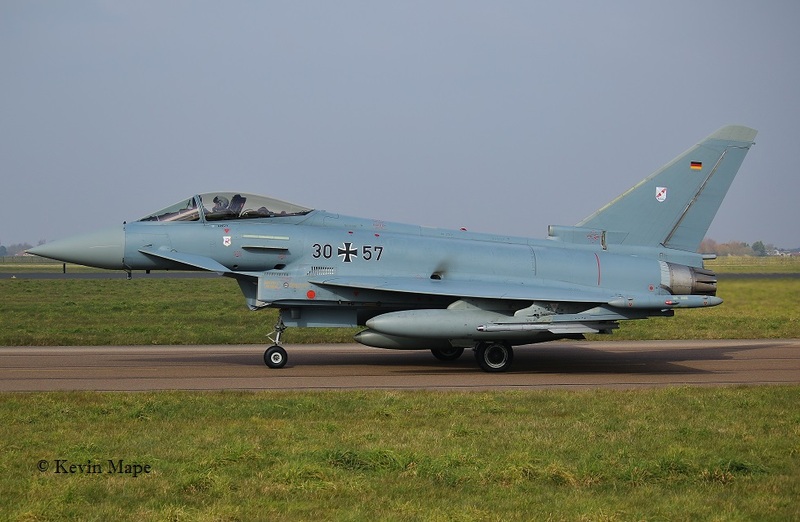 30+56,30+48,30+57 & 30+45 – EF- 2000 – German Air Force. 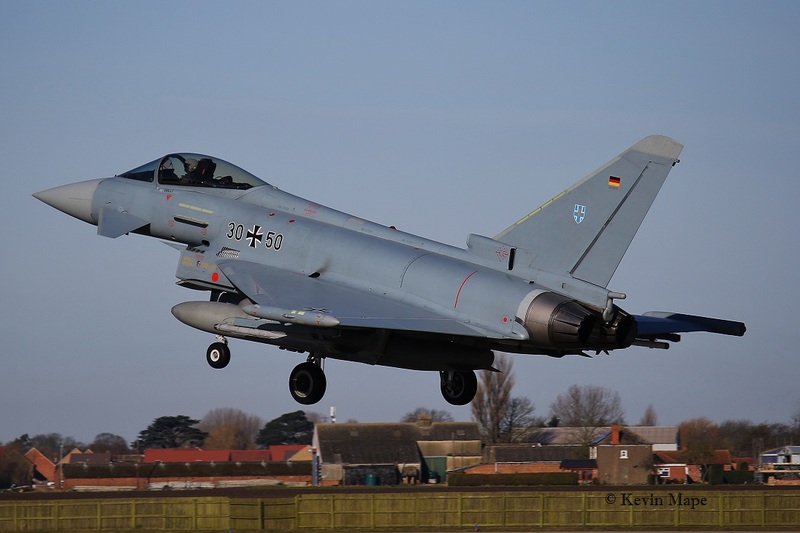 30+56,30+48,30+57,30+45,30+58,30+50 – EF- 2000 – German Air Force. 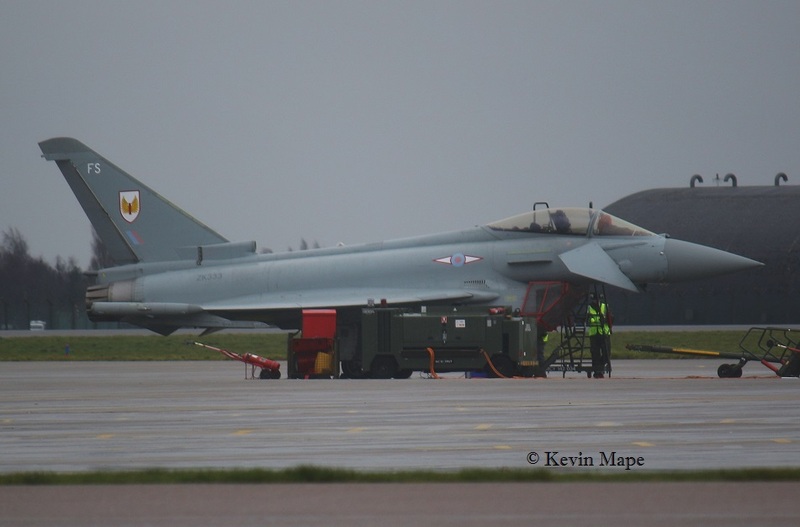 “3 Xray Echo 41” – QRA – stood down to hot pit then back to shelter. ZH101/01/8Sqn/Sentry AEW1 c/s “Ascot 7005” – Departed. 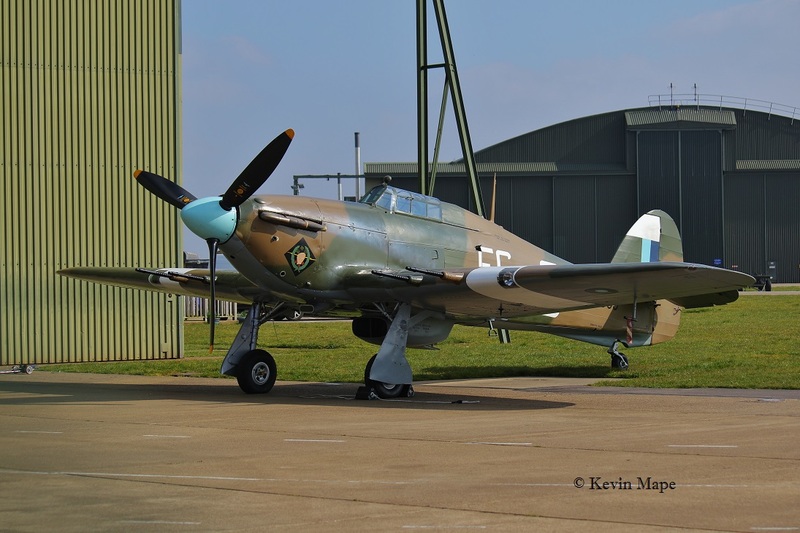 PZ865/EG-S/BBMF/Hurricane IIc – Noted north side of the BBMF Hangar. 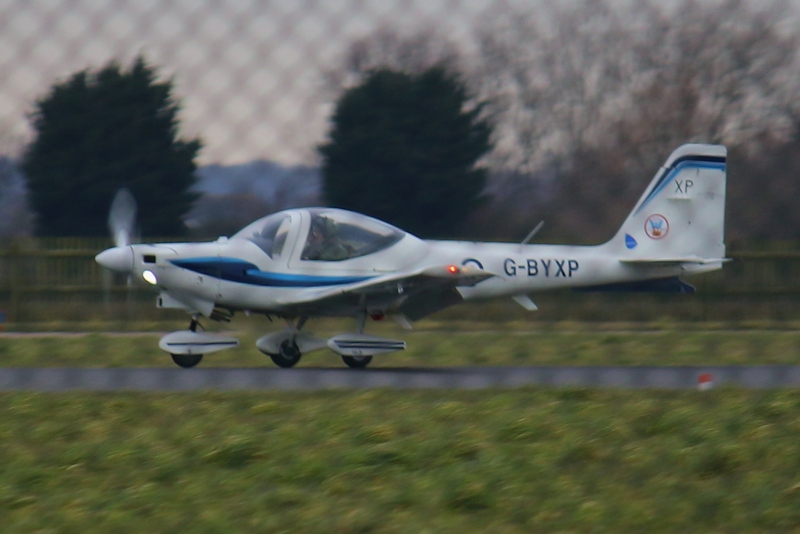 G-BYVO/VO/3FTS/Tutor T1 c/s “Cranwell 22” – Overshoot. QRA change over – ZJ924/DD out – ZJ912/DR in. 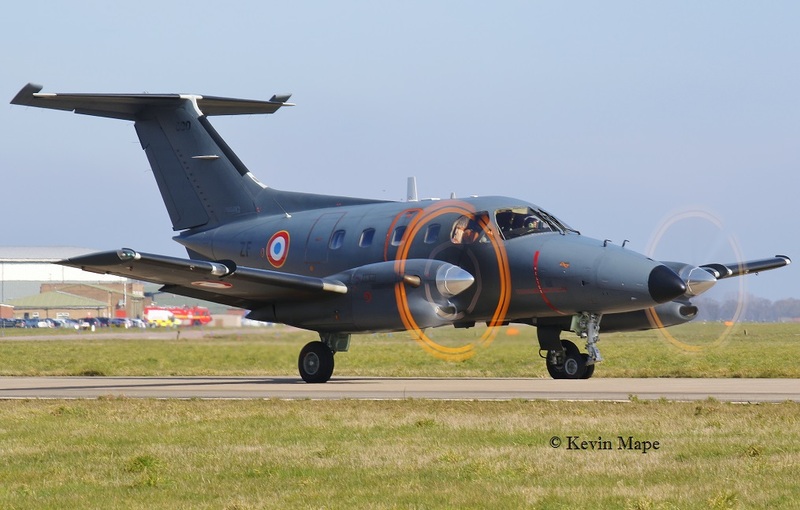 G-FRAS/AS/Cobham/Falcon 20 EW c/s “Zodiac 1 ” – Mission. 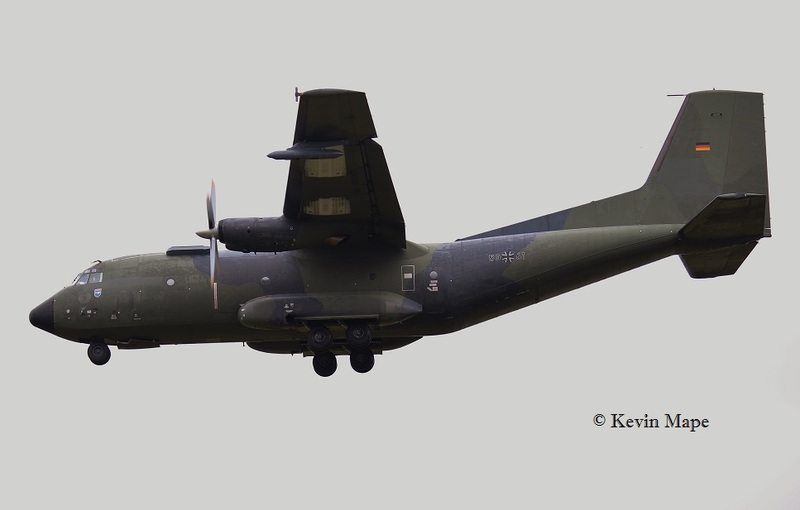 ZH106/06/8Sqn/Sentry AEW1 c/s “Ascot 7006” – Landed. Sierra – German EF-2000 -30+45,30+48,30+50,30+57,30+58. 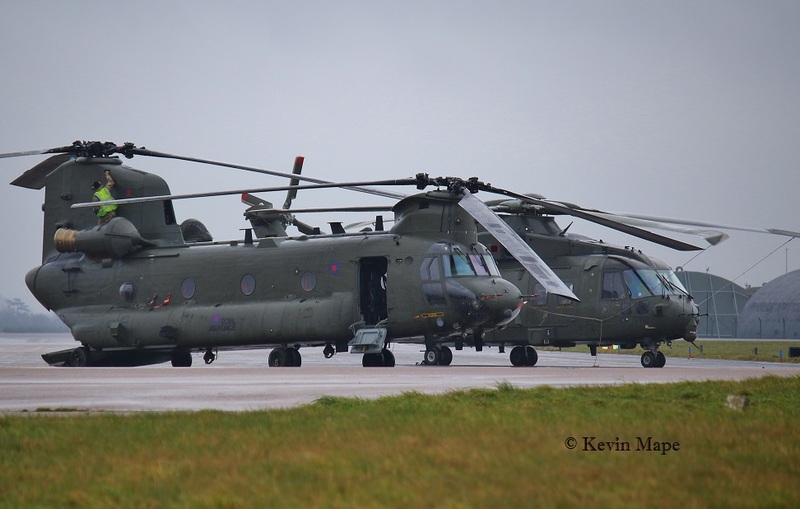 9th Wed Log thanks to Zac Hinchcliffe – Heavy rain – Runway 07 in use. G-MAJH /JH/ Eastern/ Jetstream 41 / c/s ”East Flight 102” in: 09:01, “103” out: 10:25 approx. 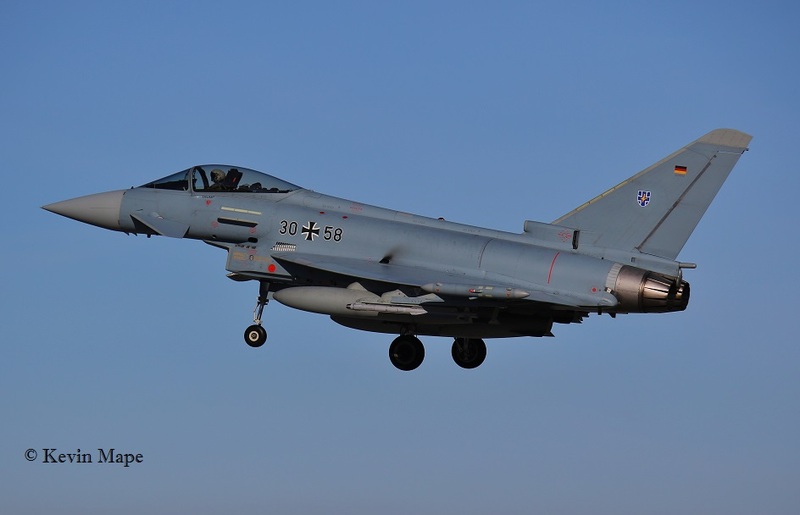 Sierra – 4 x EF-2000 German Air Force. 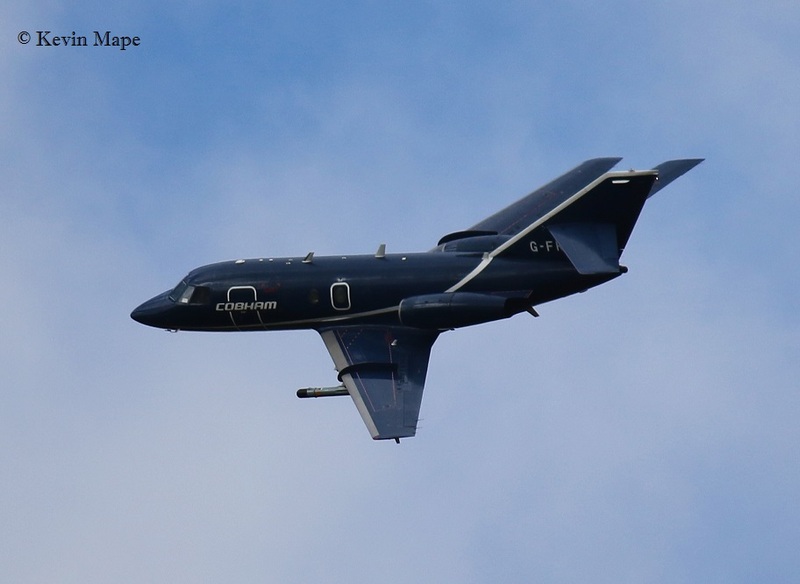 G-FRAS/AS/Cobham/Falcon 20 EW c/s “Zodiac 2” – Departed. 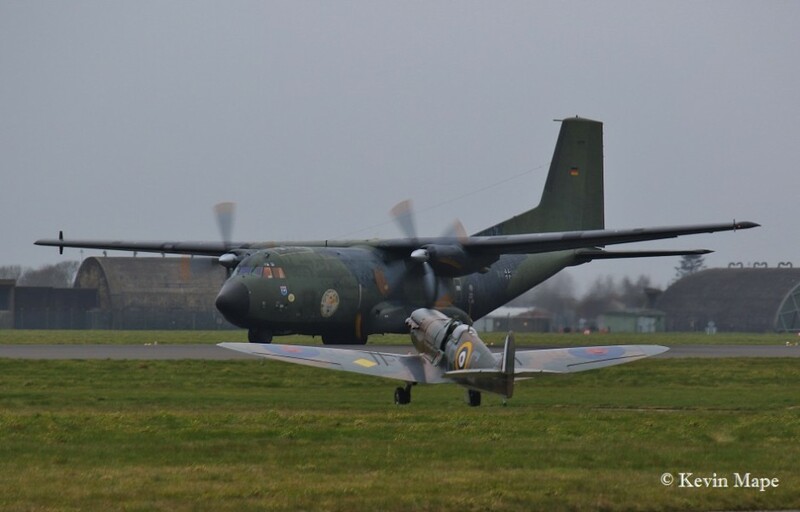 ZH107/07 / 8sq / Sentry E3D / c/s ”NATO 34” – Landed. 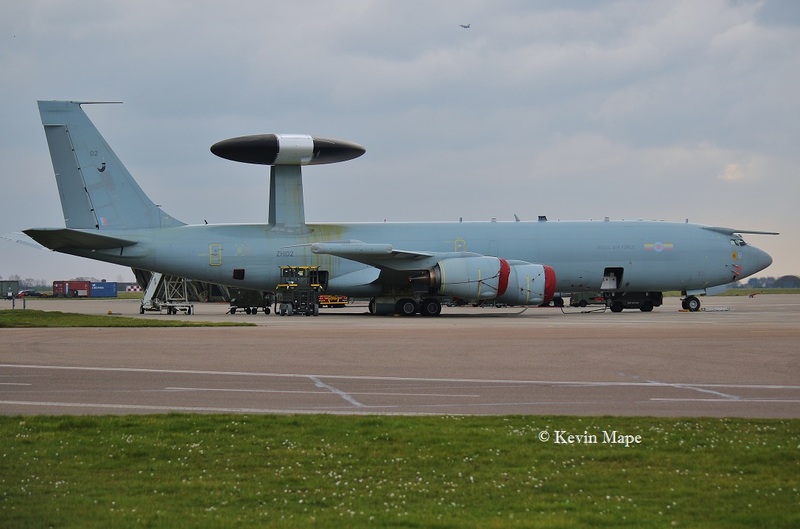 ZH106/06/8Sqn special/Sentry AEW1 c/s “Nato 32” – Departed. G-MAJH/JH/Eastern/ Jetstream 41 c/s “East Flt 102” in “103” – out. ZJ942/DH/11(F)Sqn/Typhoon FGR4 – Towed from South to North side. No log for the afternoon. ZA607/EB-X/41(R)TES/Tornado GR4 c/s “Ascot 9691” -Landed. 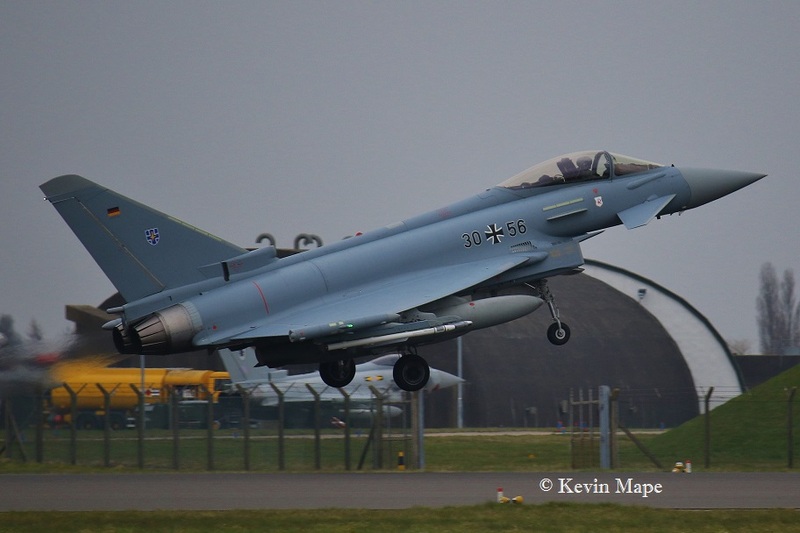 ZJ911/QO-Z/3(F)Sqn/Typhoon FGR4 c/s “Ascot 9804” – Landed. 30+45/TLG 73/EF-2000 – Remained on Sierra. 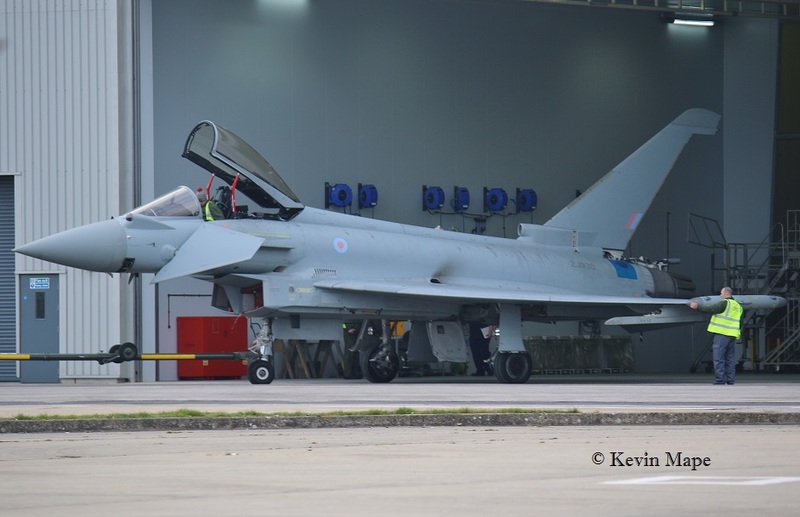 ZJ944/Unmarked/Typhoon FGR4 – Towed from the Paint shop to TMF. ex F 1435 Flt. 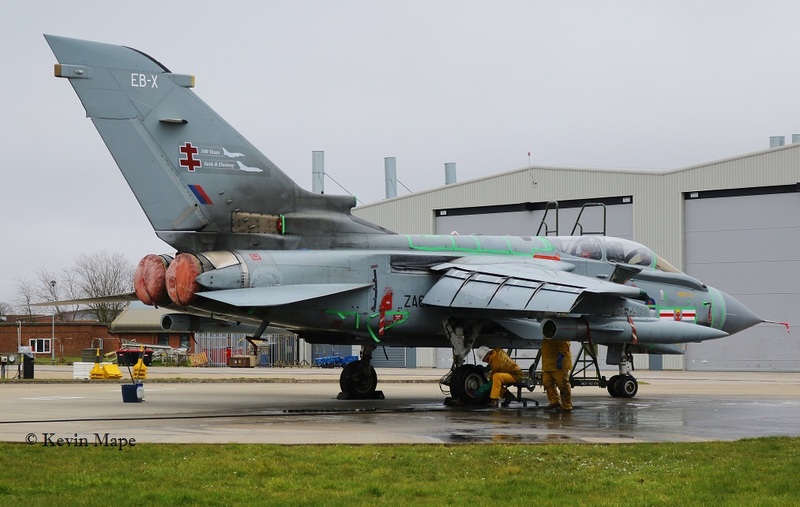 ZJ929/DL/11(F)Sqn/Typhoon FGR4 – Towed into the Paint shop. ZJ208/Apache AH1 c/s “Viper 2” – Overfly – North. ZJ190/Apache AH1 c/s “Viper 1” – Overfly – North. N0.082/YG/EAT00.319/Xingu c/s “Cotam 1730” – Parked on the ASP. N0.090/ZF/EAT00.319/Xingu c/s “Cotam 1720” – Parked on the ASP. ZJ198/Apache AH1 c/s “Prowler 2” – Overfly – North. N0.090/ZF/EAT00.319/Xingu c/s “Cotam 1720” – Departed. ZJ125/J/845NAS/Merlin HC2 c/s “Junglie 427” PAN – Tail problem. ZJ806/BE/29(R)Sqn/Typhoon T3 c/s “Typhoon 42” – Display practice. G-MAJH/JH/Eastern/ Jetstream 41 c/s “East Flt 104” in “105” – out. ZJ131/O/845NAS/Merlin HC2 c/s “Junglie 423” – with parts for ZJ125. – Departed. Spitfire Vb – AB910 – To Compass swing. 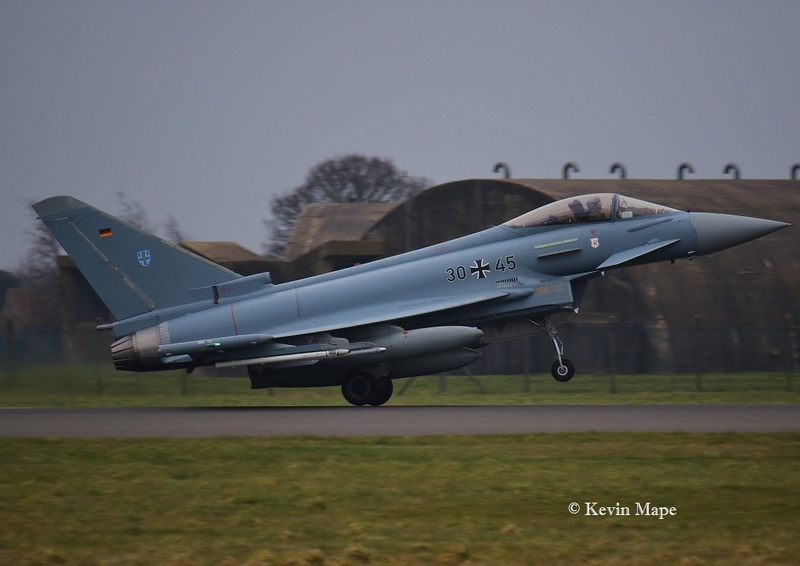 ZJ931/DA/11(F)Sqn/ Typhoon FGR4 – Towed from TMF to the ASP. 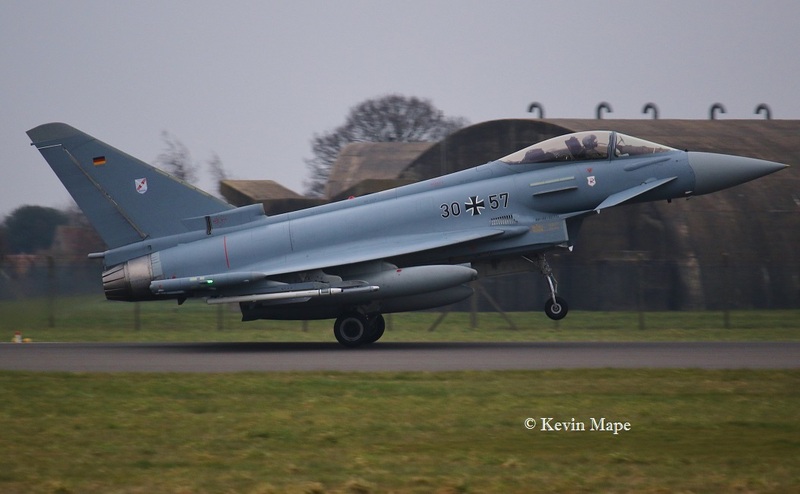 ZK379/BB/29(R)Sqn/Typhoon T3 – Towed from TMF to the ASP. ZJ125/J/845NAS/Merlin HC2 c/s “Junglie 427” – Engine runs. 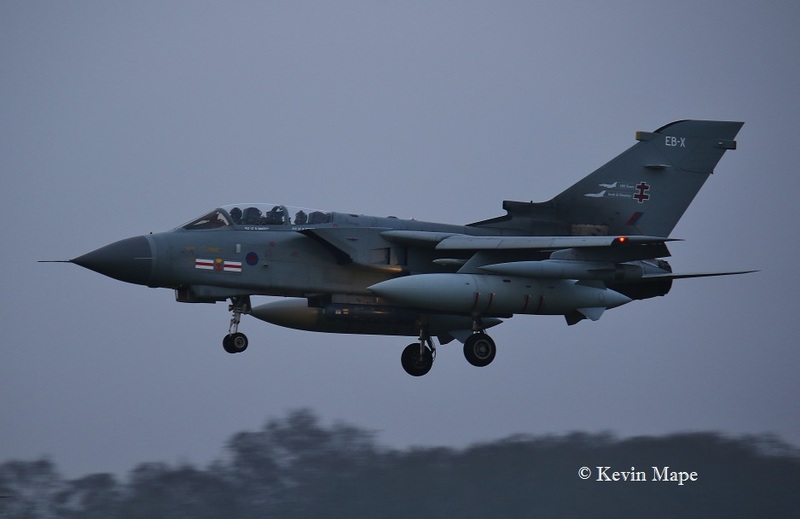 ZA607/EB-X/41(R)TES/Tornado GR4 – Towed onto the Wash pan. P7350/EB-G/BBMF/Spitfire IIa – Engine runs – North side of BBMF Hangar. 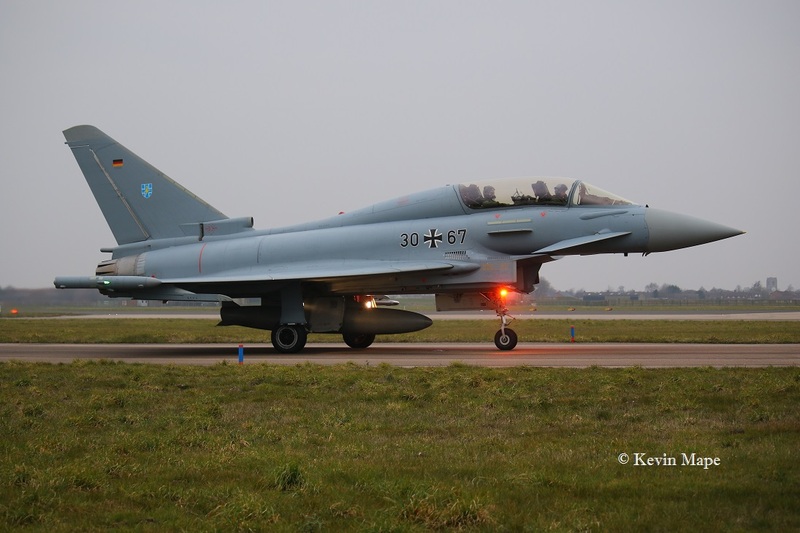 ZJ944/Unmarked/Typhoon FGR4 – Towed from TMF to HAS 61. 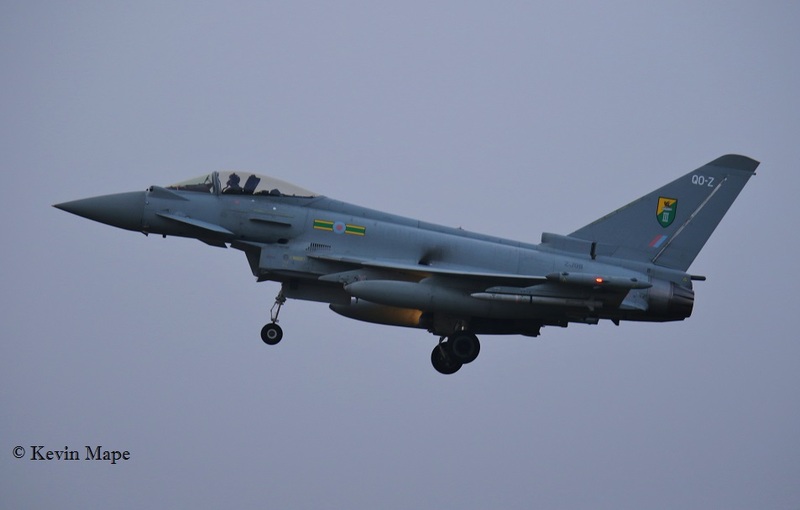 ZJ914/EB-G/41(R)TES/Typhoon FGR4 – Towed into HAS 11. 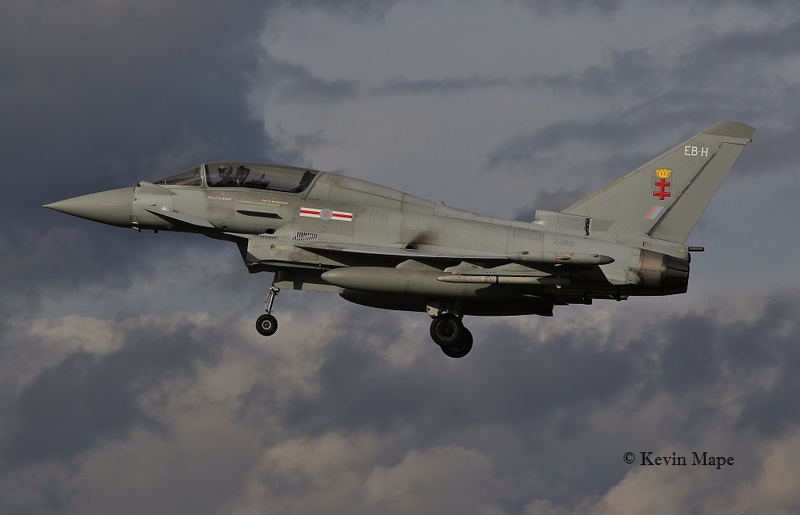 ZJ950/C/1435 Flt/Typhoon FGR4 – Towed from HAS 11 to Foxtrot. 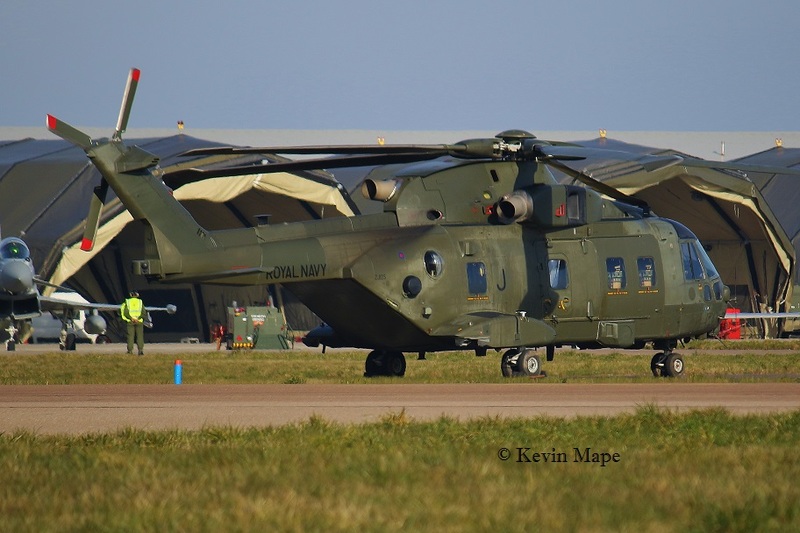 ZJ125/J/845NAS/Merlin HC2 c/s “Junglie 427” – Departed. ZK365/Unmarked/Typhoon FGR4 c/s “Tarnish 9” – Delivery from Warton. 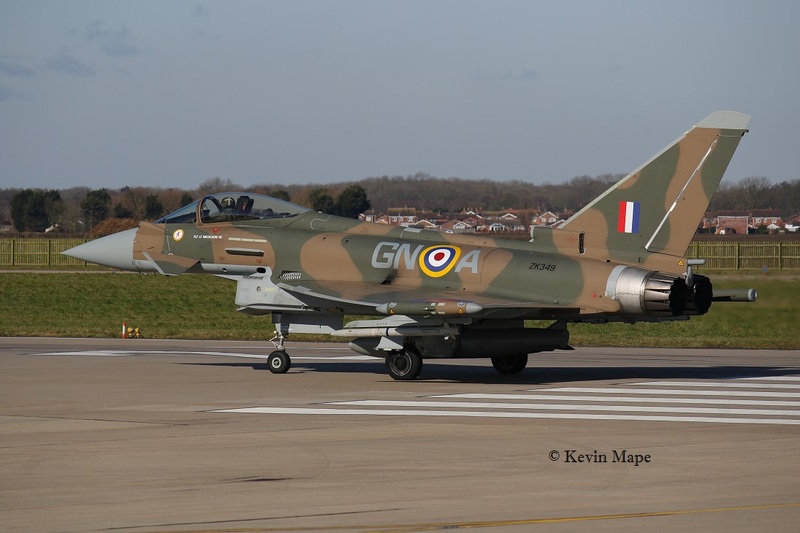 ZK354/-/11(F)Sqn/Typhoon FGR4 – Towed from HAS 10 to HAS 56 in Foxtrot. 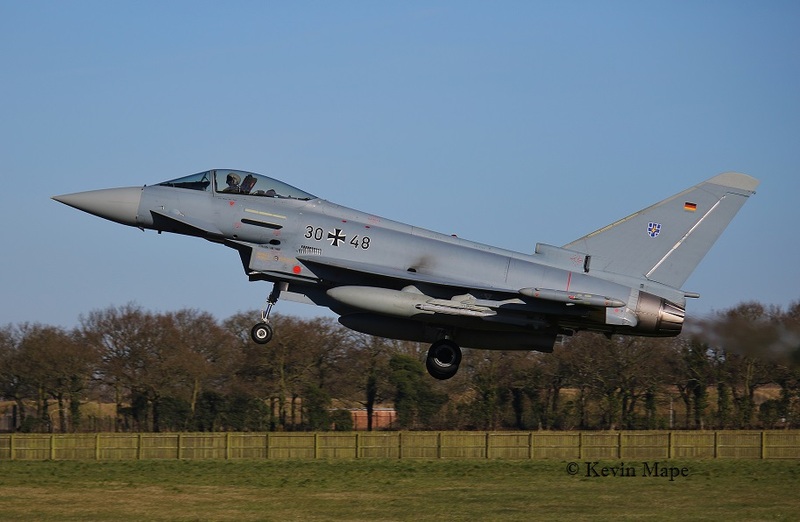 ZJ942/DH/11(F)Sqn/Typhoon FGR4 – Towed from Foxtrot to Echo. ZH107/07/8Sqn/Sentry AEW1 c/s “Selex 01” – Departed. 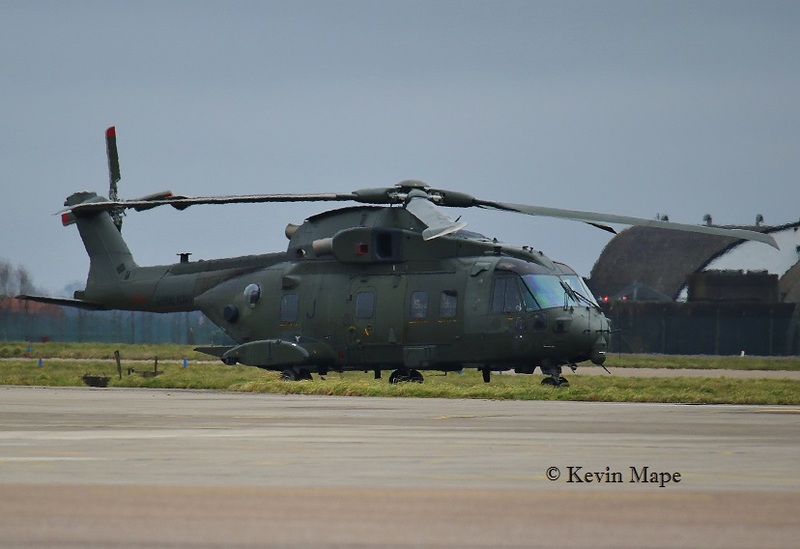 ZH107/07/8Sqn/Sentry AEW1 c/s “Selex 01” – Landed. 16th Wed Log thanks to Garf,Rich & Steve. 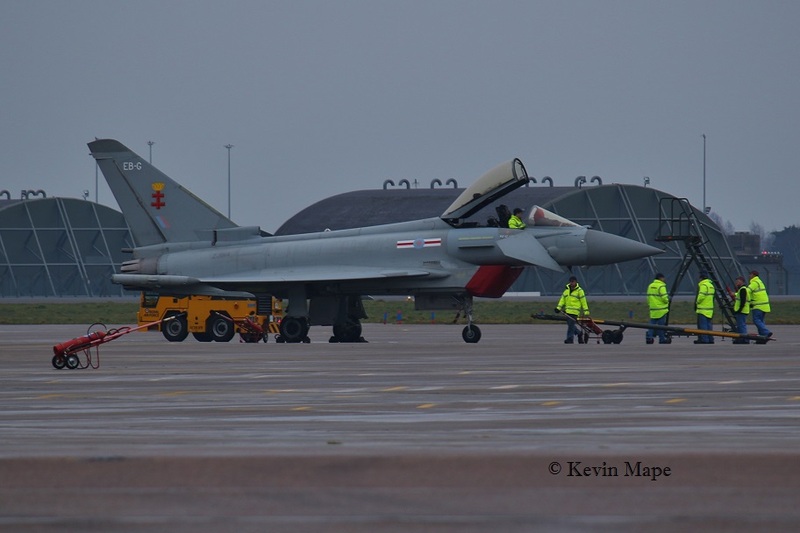 ZJ937/DT/11(F)Sqn/Typhoon FGR4 – Towed onto the Wash pan. ZK316/FA/Unmarked/Typhoon FGR4 – Towed South to North. 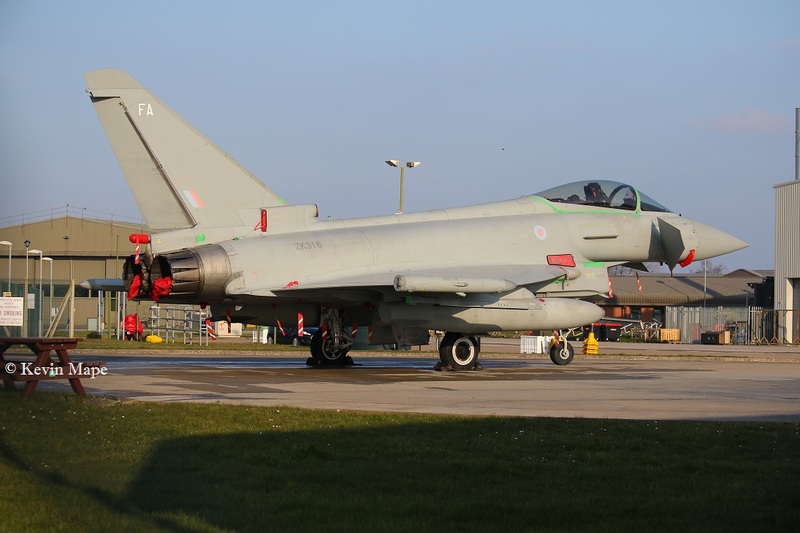 ZJ944/Unmarked/Typhoon FGR4 – Towed onto the ASP. ZJ916/QO-S/3(F)Sqn/Typhoon FGR4 c/s “Cobolt 14” – To Lossiemouth. XZ345/7 Flt/Gazelle AH1 c/s “Army Air 744” – Parked on the ASP. 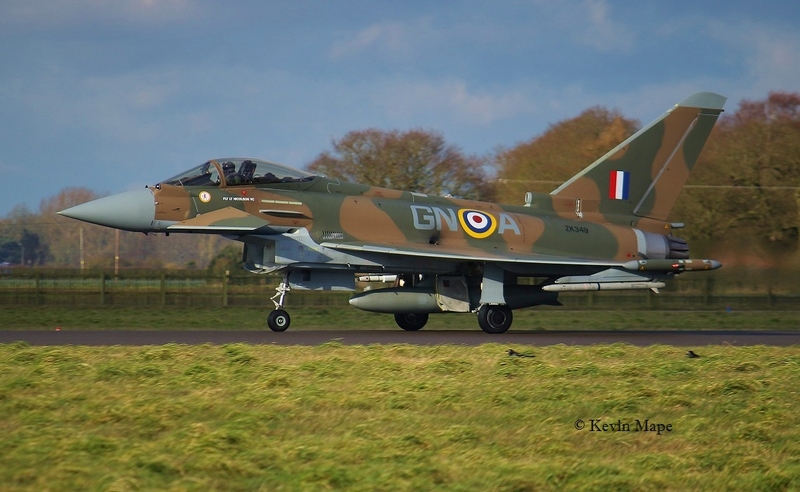 ZJ937/DT/11(F)Sqn/Typhoon FGR4 – Towed from the Wash pan to HAS53 in Foxtrot. 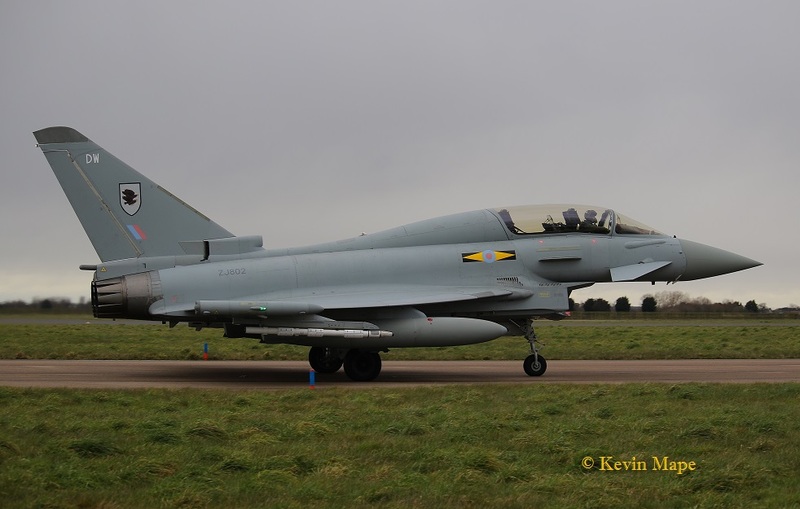 ZJ917/DG/11(F)Sqn/Typhoon FGR4 – Towed to the Wash pan. 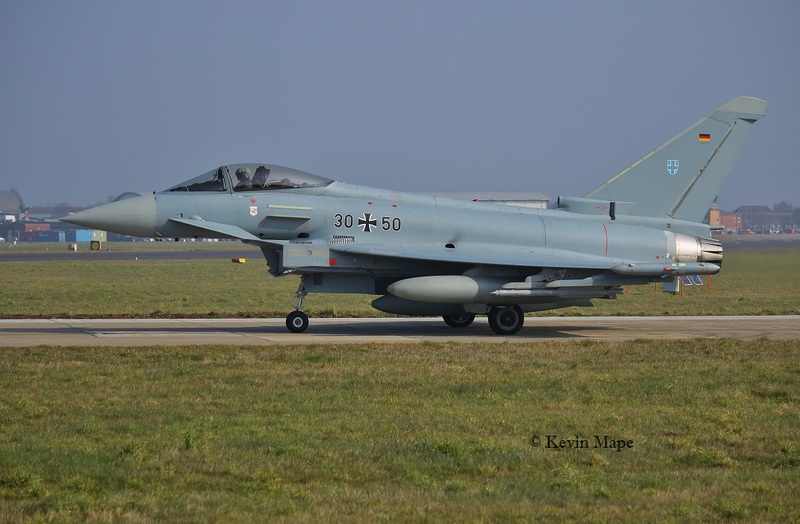 ZJ939/QO-R/11(F)Sqn/Typhoon FGR4 – Towed onto the ASP. 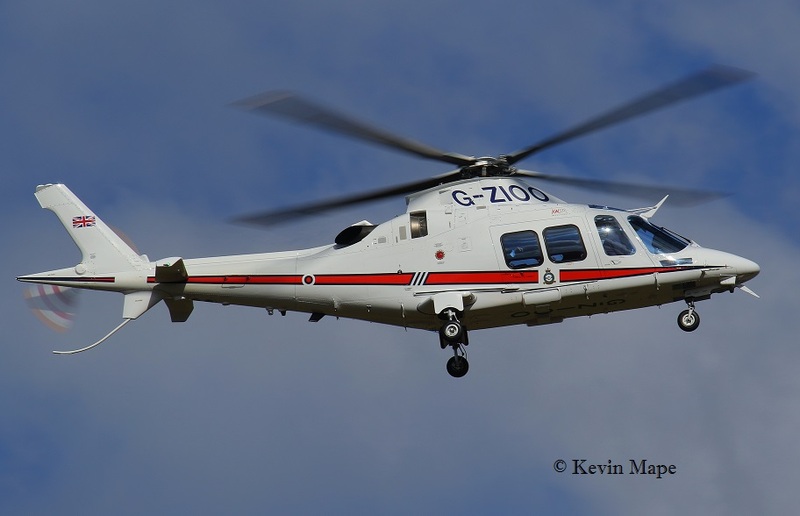 G-ZIOO/32(TR)Sqn /Agusta AW109 SP c/s “Ascot 1297” – Departed. G-MAJH/JH/Eastern/ Jetstream 41 c/s “East Flt 103” in “104” – out. 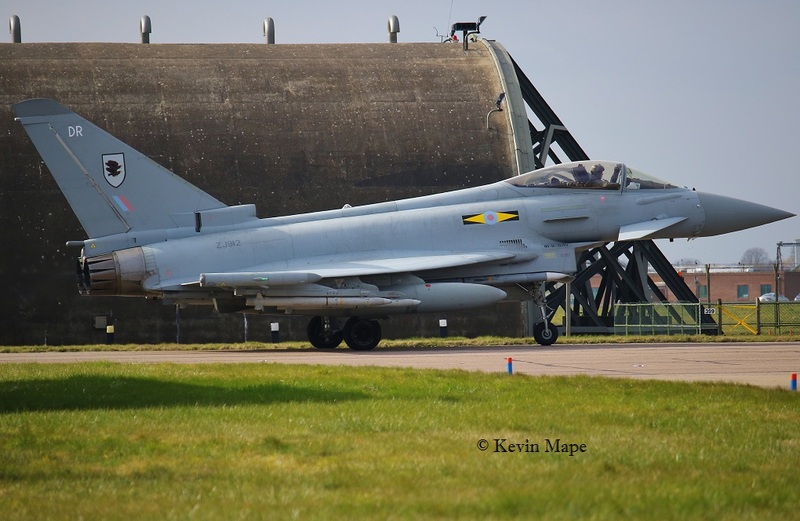 ZK344/II/II(AC)Sqn/Typhoon FGR4 – Noted outside TMF. 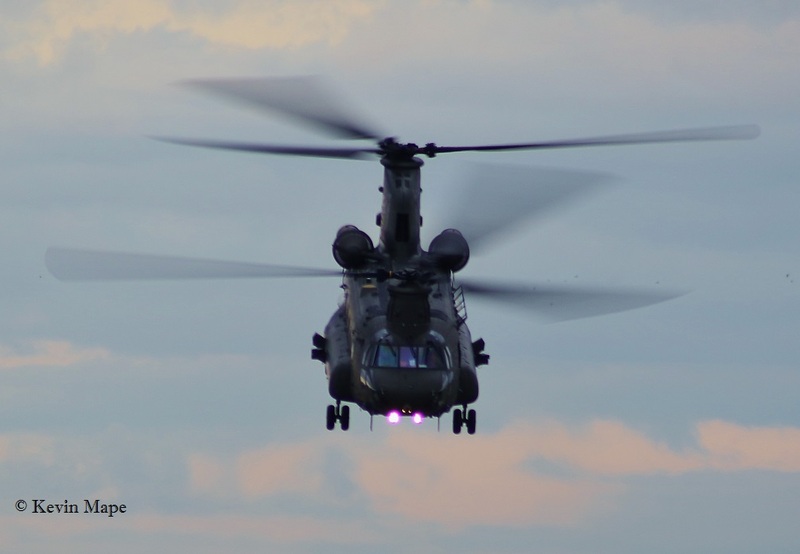 ZD980/18-27Sqn/Chinook HC4 c/s “Vortex 591” – Overshoot. 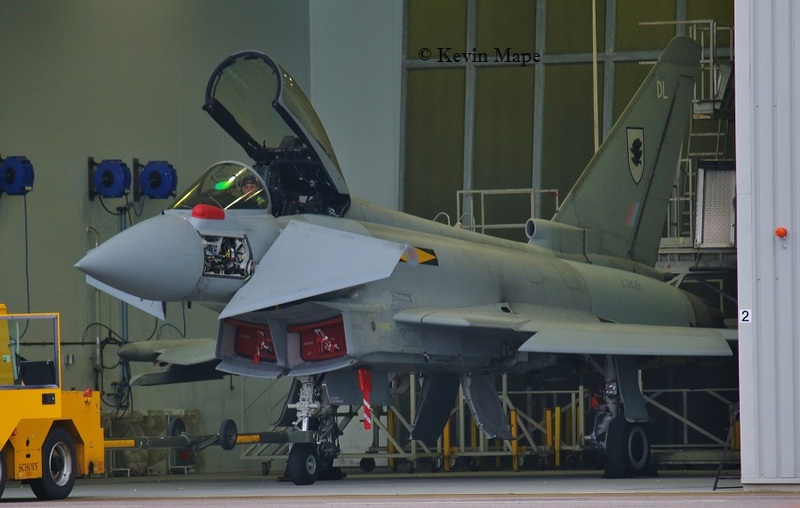 ZJ923/Unmarked/Typhoon FGR4 – Noted on the Wash pan. N0.082/YG/EAT00.319/EMB – 121 Xingu – Parked on the ASP since 14th – Engine runs. 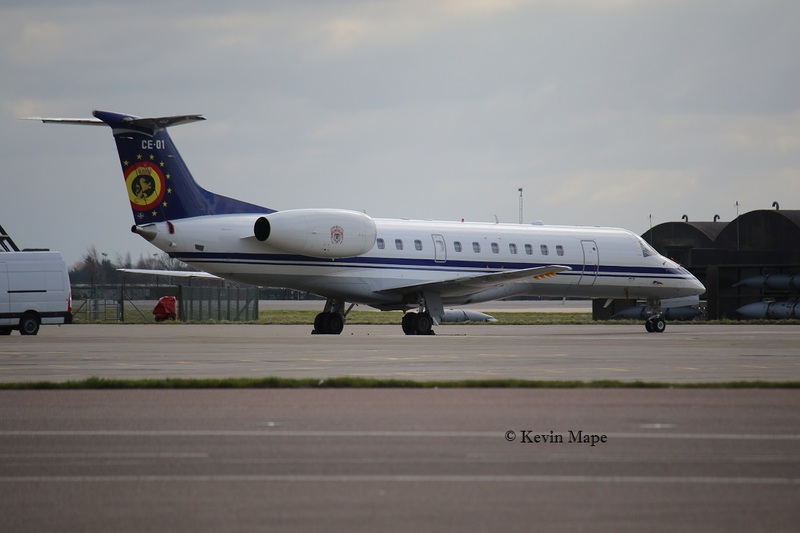 G-FRAS/AS/Cobham/Falcon 20 EW c/s “Zodiac 3” – Departed. 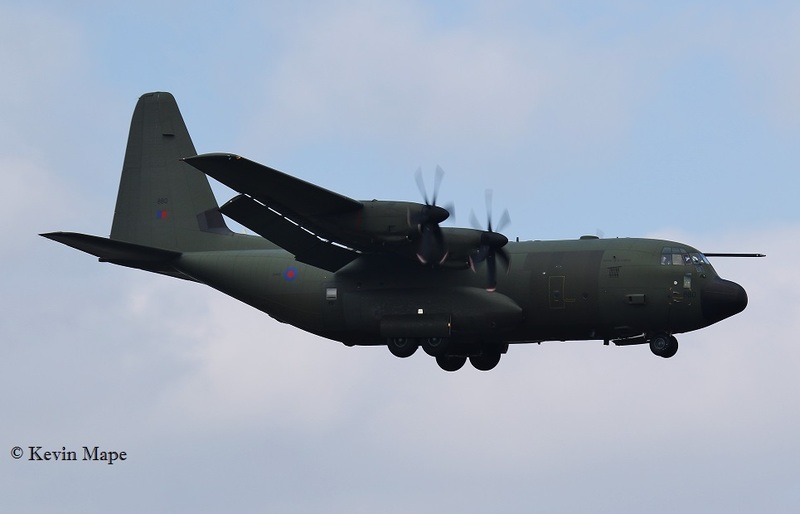 ZH880/880/47Sqn/Hercules C5 c/s “Ascot 5608” – Collecting ground support equipment for the Red arrows. PZ865/EG-S/BBMF/Hurricane IIc -Noted outside BBMF Hangar. 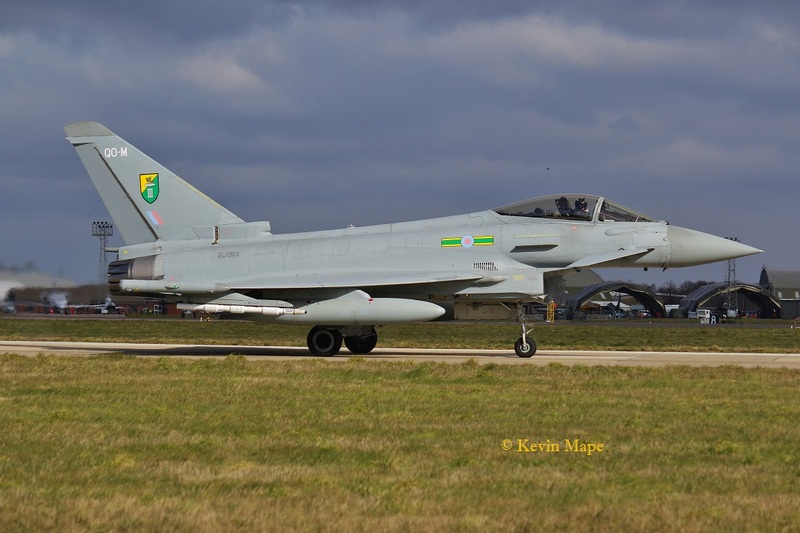 ZK316/FA/Unmarked/Typhoon FGR4 – Noted on the Wash pan. ZJ806/BE/29(R)Sqn/Typhoon T3 c/s “Typhoon 29” – Displayed at Scampton. ZH880/880/47Sqn/Hercules C5 c/s “Ascot 5608” – Departed to Tangra Air Base -Greece. ZJ815/EB-H/41(R)TES/Typhoon T3 c/s “Apollo 2” – To Boscombe down. 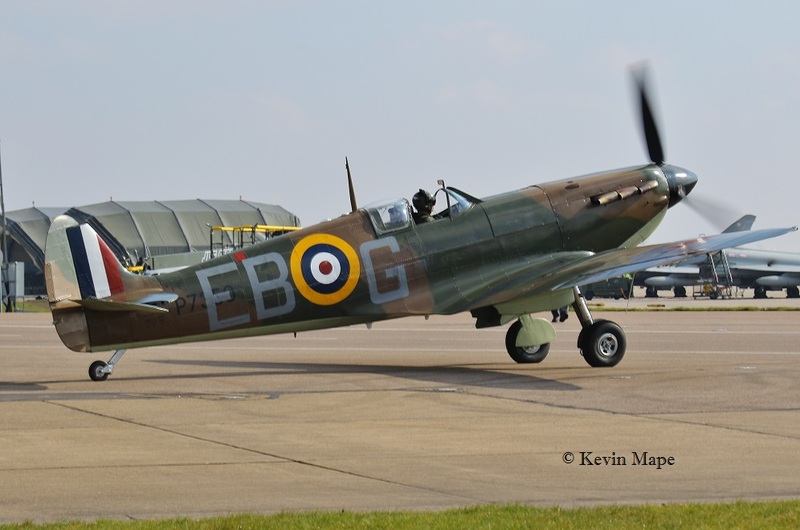 P7350/EB-G/BBMF/Spitfire IIa c/s “Spitfire 90” – 1st flight this year – Air test. ZJ944/Unmarked/Typhoon FGR4 – Towed to the Hush house. G-FRAS/AS/Cobham/Falcon 20 EW c/s “Tasman ” – Parked on the ASP. 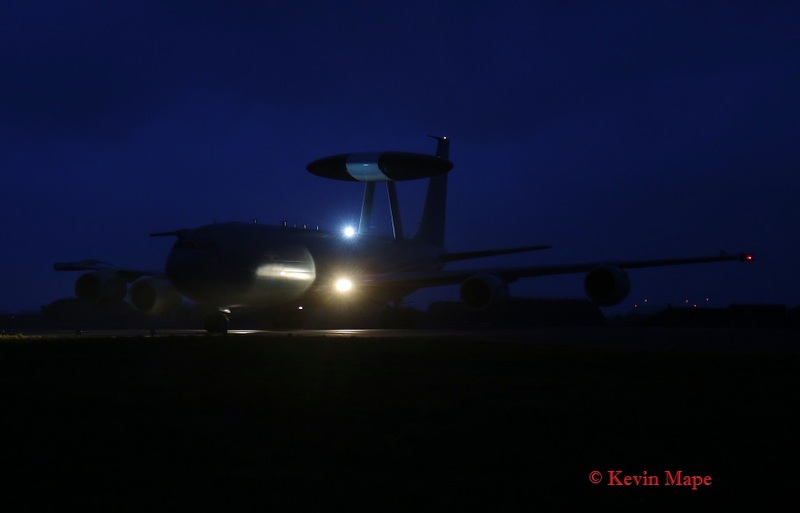 ZH106/06/8Sqn special/Sentry AEW1 c/s “NATO 35” Landed. 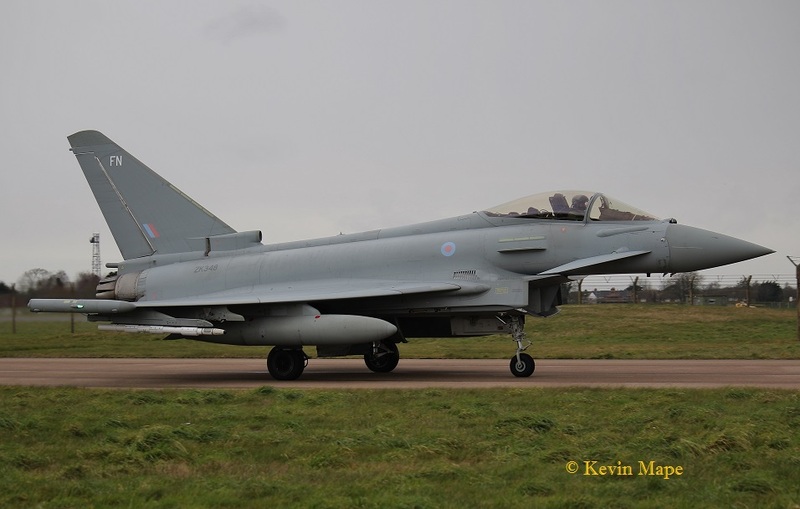 ZJ920/QO-A/3(F)Sqn/Typhoon FGR4 – Towed to wash pan. ZJ929/DL/11(F)Sqn/Typhoon FGR4 – Towed from Paint shop to TMF. G-MAJH/JH/Eastern/ Jetstream 41 c/s “East Flt “101” in “102” – out. ZJ914/DZ/11(F)Sqn/Typhoon FGR4 c/s “Deluge 51” – f/f in marks. ex EB-G.
ZJ815/EB-H/41(R)TES/Typhoon T3 c/s “Rebel 41” – Return from Boscombe Down..
G-MAJH/JH/Eastern/ Jetstream 41 c/s “East Flt “103” in “104” – out. ZK344/II/II(AC)Sqn – towed to the ASP. 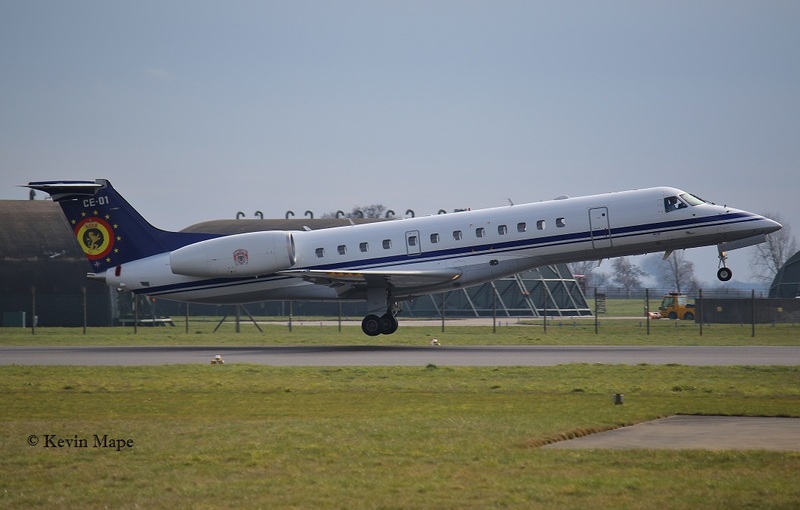 ZJ911/QO-Z/3(F)Sqn – Towed to Foxtrot. HAS 52. TE311/4D-V/BBMF/Spitfire XIVe – Engine runs. 21st Mon Log thanks to Steve & Susie Matson. G-MAJH/JH/Eastern/ Jetstream 41 c/s “East Flt “102” in “103” – out. ZJ935/DJ/11(F)Sqn/Typhoon FGR4 – Towed to the Wash pan. ZH106/06/8Sqn/Sentry AEW1 c/s “NATO 30” – Departed. 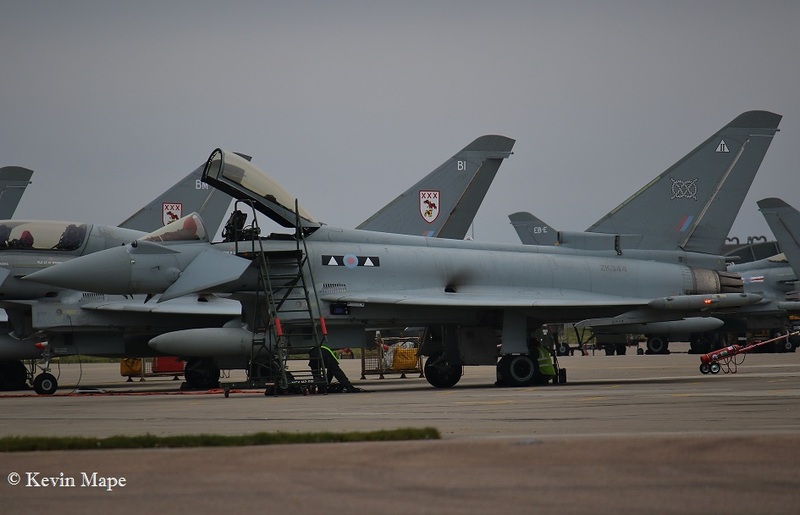 ZK314/EO/Unmarked/Typhoon FGR4 c/s ” Ascot 9871″ – From Akrotiri -Parked in Foxtrot. 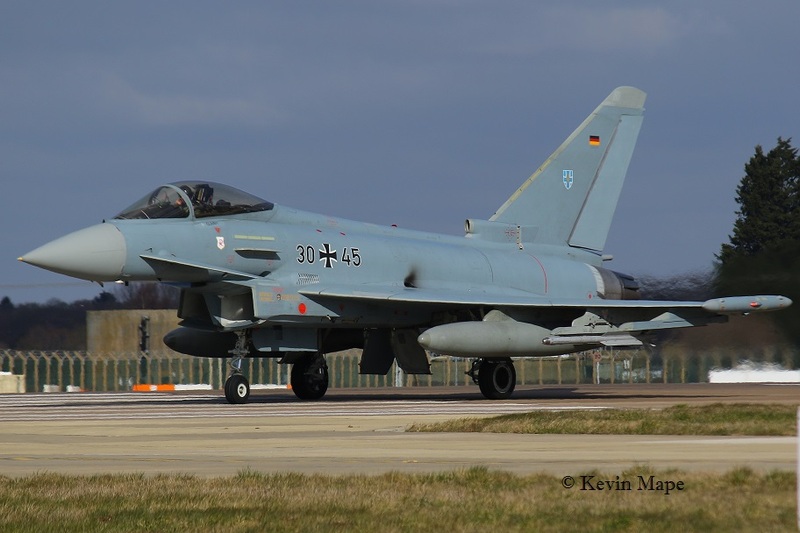 ZK305/EE/Unmarked/Typhoon FGR4 c/s ” Ascot 9872″ – From Akrotiri – Parked in Echo. G-FRAS/Cobham/Falcon 20 EW c/s “Tazmin” – Parked on the ASP. G-MAJH/JH/Eastern/ Jetstream 41 c/s “East Flt “104 in “105 – out. ZJ813/BL/29(R)Sqn/Typhoon T3 c/s ” Typhoon 42″ – display. 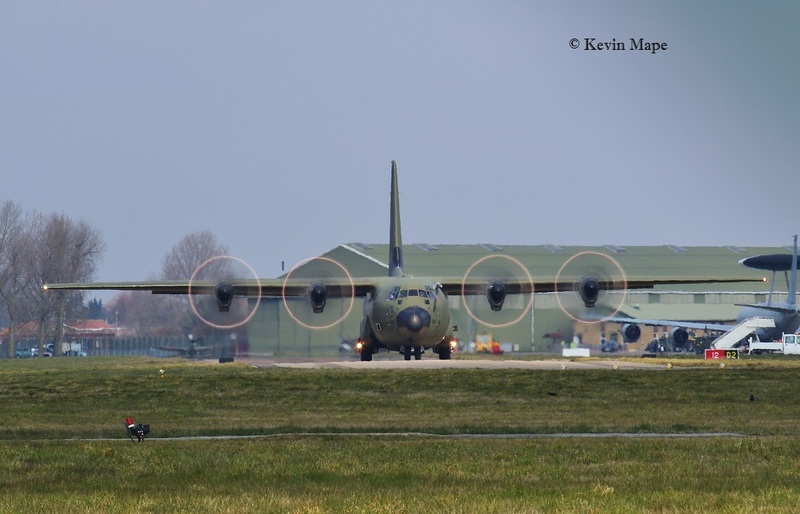 ZH106/06/8Sqn/Sentry AEW1 c/s “NATO 30” – Landed. ZJ939/QO-R/3(F)Sqn/Typhoon FGR4 – Towed from Southside of TMF to Northside. 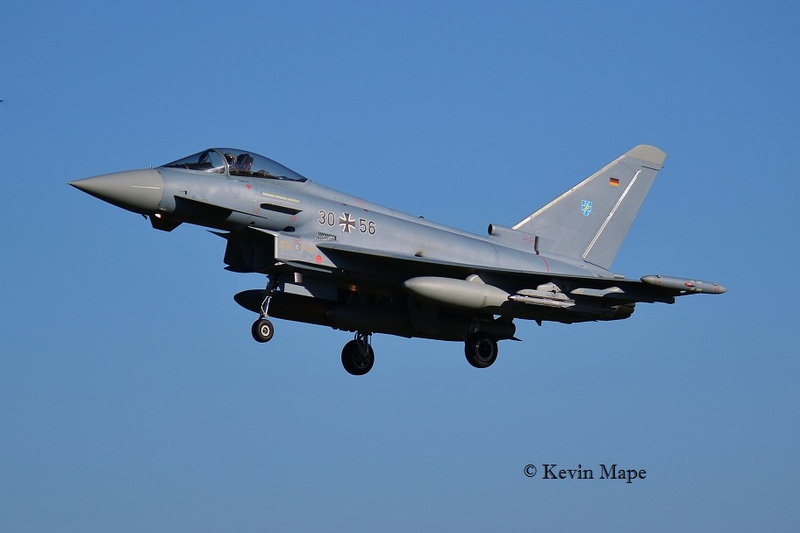 ZK313/Unmarked/Typhoon FGR4 – Noted on the ASP. 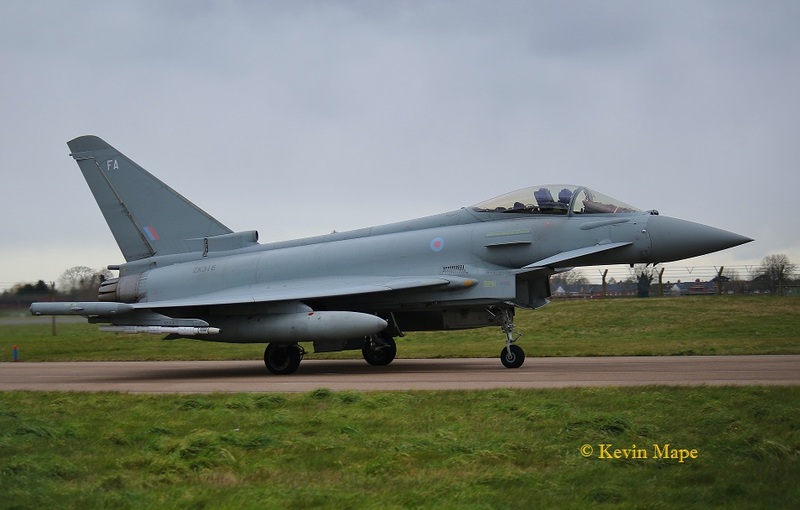 ZJ944/Unmarked/Typhoon FGR4 – Noted on the ASP. 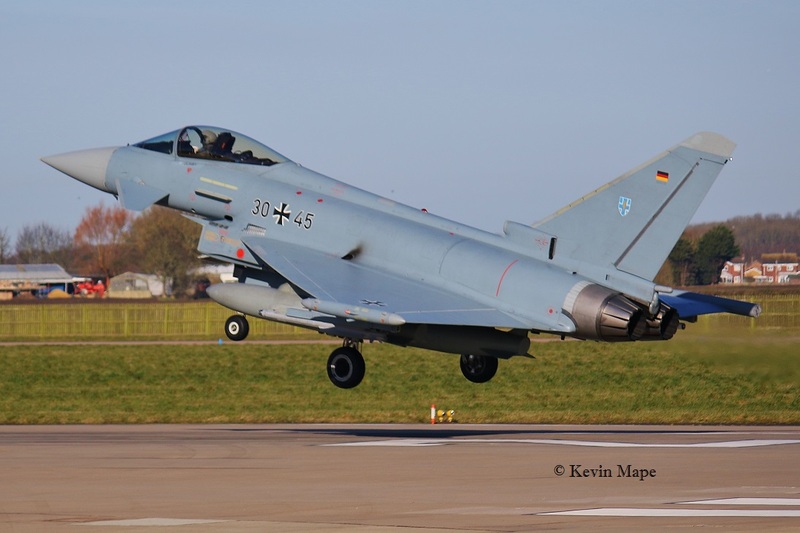 ZK344/II/II(AC)Sqn/Typhoon FGR4 – Towed onto the ASP. 22nd Tue Log thanks to Steve, Val & Rich. 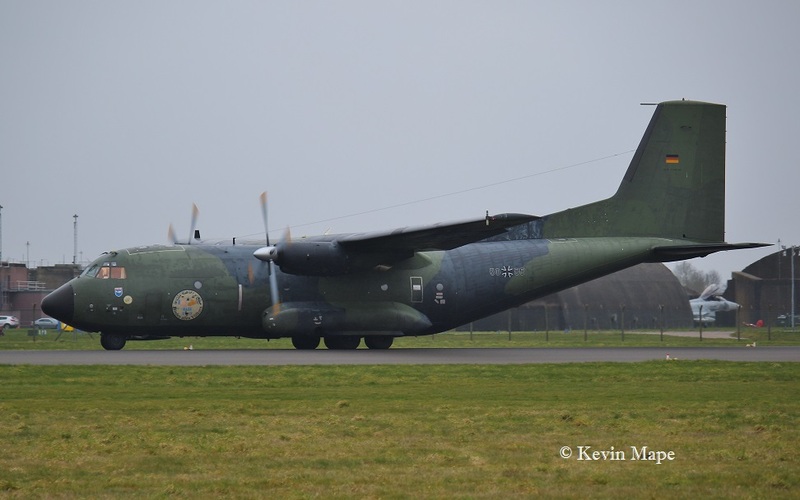 ZH106/8Sqn special/Sentry AEW1 c/s “NATO 32” – Departed. G-MAJH/JH/Eastern/ Jetstream 41 c/s “East Flt “102 in “103 – out. 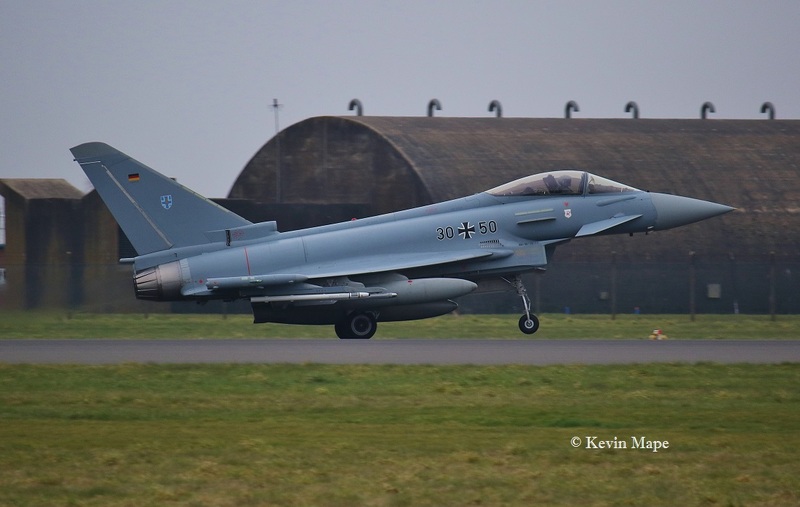 ZJ918/Unmarked/Typhoon FGR4 c/s “Cobalt 12” – From Lossiemouth ex QO-L.
ZK345/EP/6Sqn/Typhoon FGR4 c/s ” Lossie 92″ – Landed to TMF. 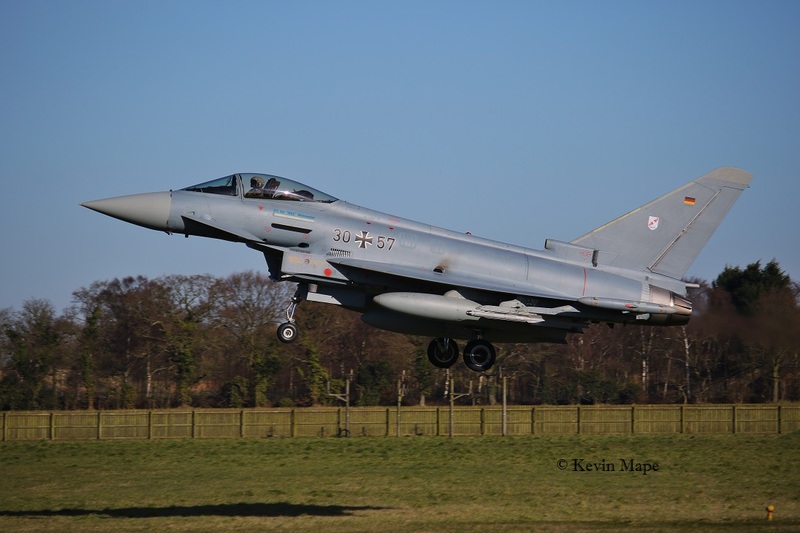 ZJ924/DD/11(F)Sqn/Typhoon FGR4 c/s ” Lossie 60″ – Delivery to Lossiemouth. AB910/SH-F/Spitfire Vc – Engine runs. 23rd Wed Log thanks to Steve,Val & Garf. ZH106/8Sqn special/Sentry AEW1 c/s “NATO 35” – Departed. ZK382/BG/29(R)Sqn/Typhoon T3 – Noted on the Wash pan. 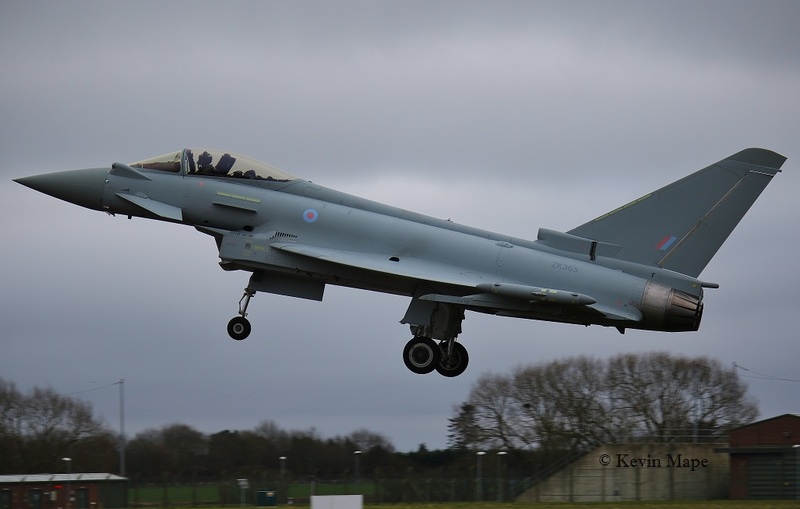 ZJ920/QO-A/3(F)Sqn/Typhoon FGR4 c/s “Lossie 92” – Delivery to Lossiemouth. 01-2001/LN rd/48FW/F-15E c/s “Custer 61” – Overshoot. 30+67/TLG73/EF2000(B) c/s “German Air Force Sierra 03” – Parked on Sierra. 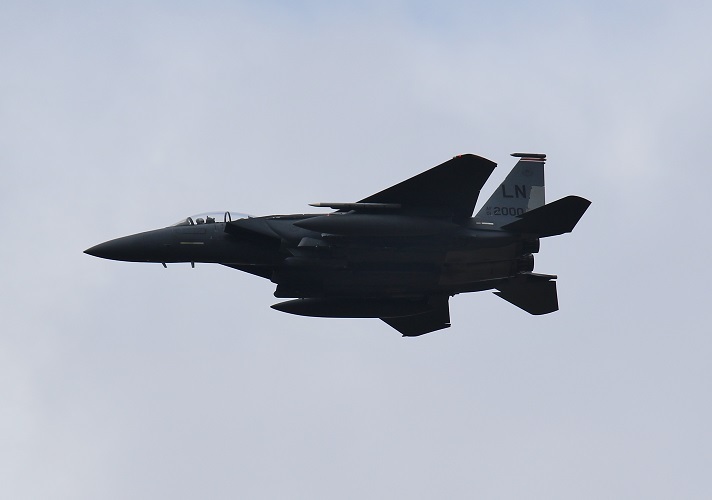 91-0327/LN bl/48FW/F-15E c/s “Slam 52” – Overshoot. ZJ806/BE/ 29(R)Sqn/Typhoon T3 c/s “Typhoon 35” – display. 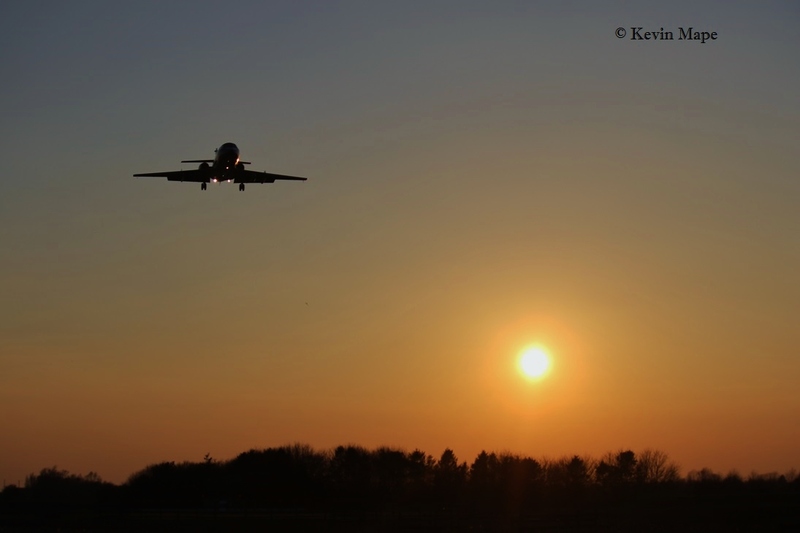 G-MAJH/JH/Eastern/Jetstream 41 c/s ” East Flt 102″ in “103” – out. G-ZINC/Cessna 182S c/s “GNC”- Parked on BBMF ramp. ZK308/BW/29(R)Sqn/Typhoon FGR4 – Noted on tow. 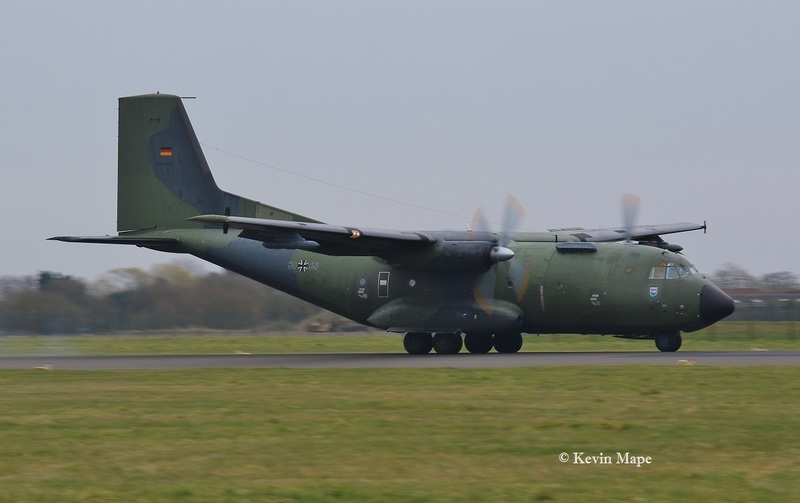 50+65/LTG 63/C-160D Transall c/s “German Air Force 061” – Departed. 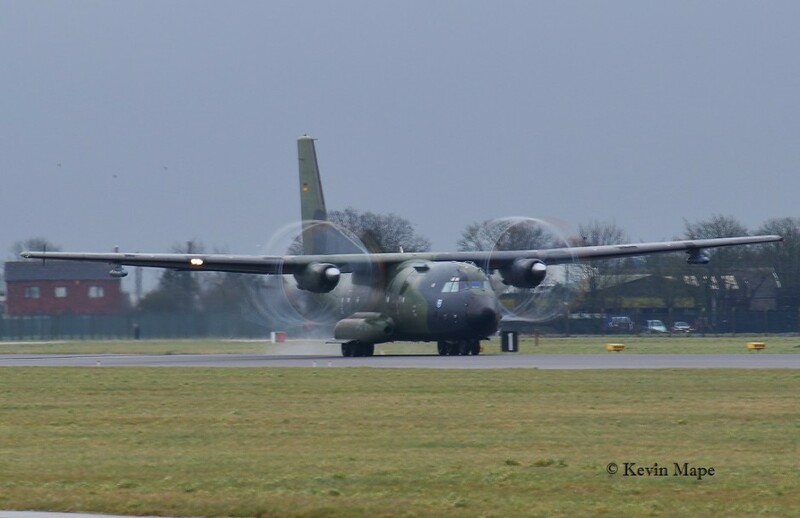 50+55/LTG 63/C-160D Transall c/s “German Air Force 052” – Departed. P7350/EB-G/BBMF/Spitfire IIa c/s “Spitfire 9*” – Air test. 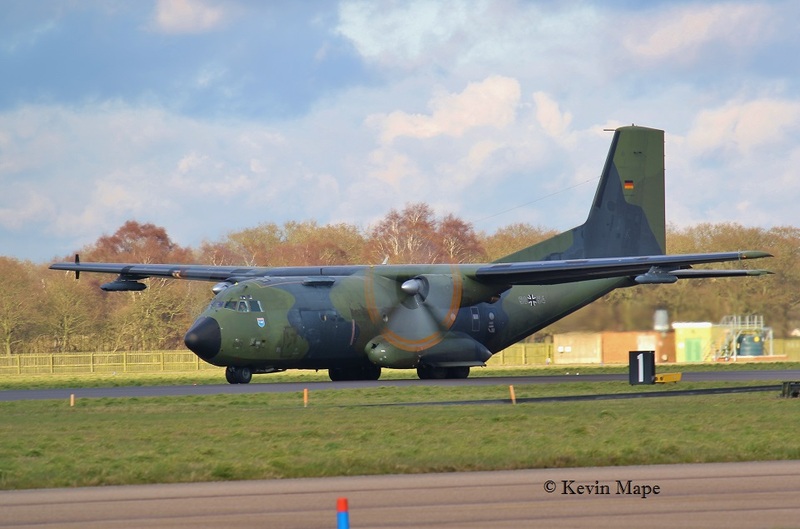 31+10/LTG61/C-160D Transall c/s “German Air Force 221” – Parked on Sierra. 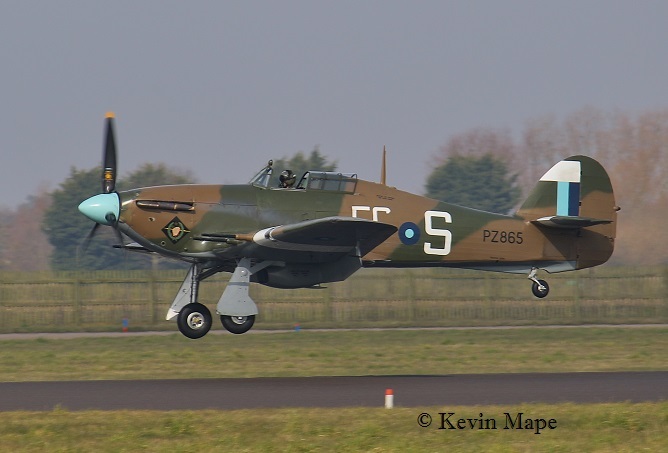 PZ865/EG-S/Hurricane IIc c/s “Hurricane 96” – First flight for Wg Cdr Smiley. – Well done Sir ! G-MAJH/JH/Eastern/ Jetstream 41 c/s “East Flt “101 in “102 – out. 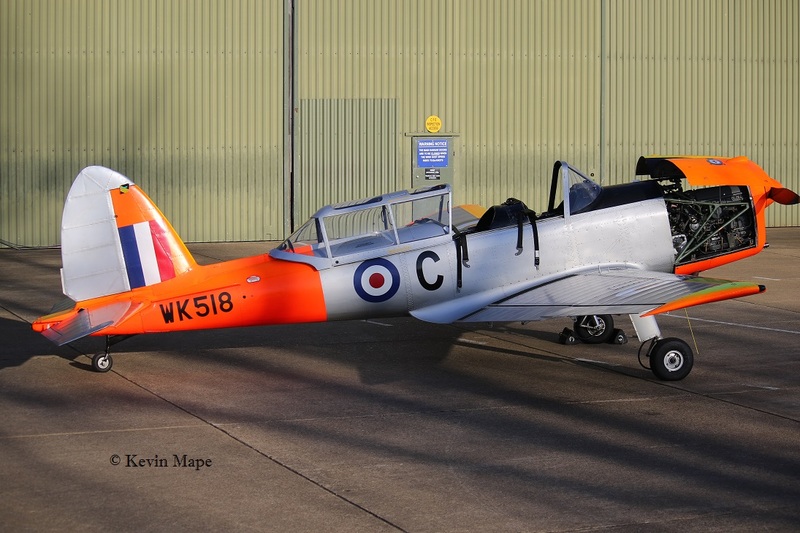 ZF243/243/1FTS/Tucano T1 c/s “Lop 04” – Parked on the ASP. 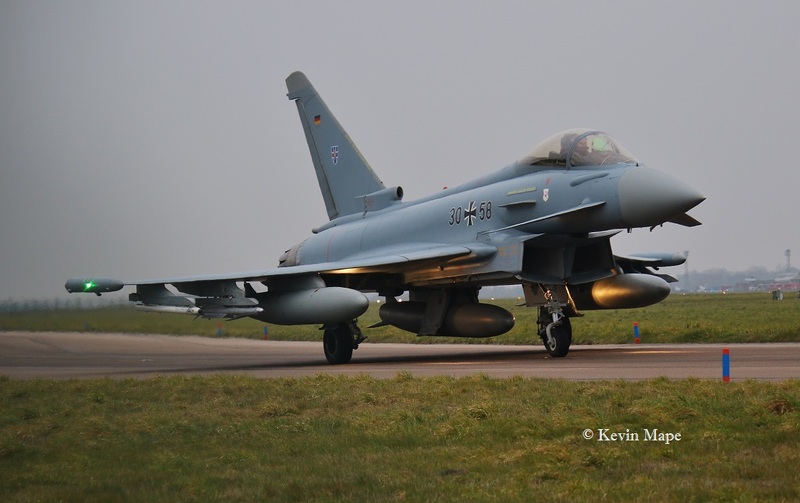 ZK307/O/II(AC)Sqn/Typhoon FGR4 c/s ” Lossie 68″ delivery to 3(F)Sqn. 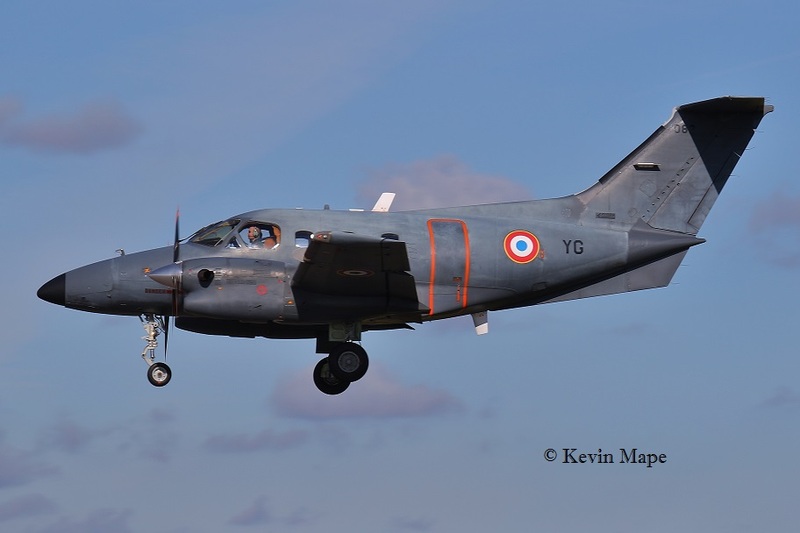 XX332/CD/100Sqn/Hawk T1 c/s ” Javelin 18″ – Overshoot. P7350/EB-G/BBMF/Spitfire IIa c/s ” Spitfire 90″ – Display. ZJ934/QO-T/3(F)Sqn/Typhoon FGR4 c/s ” Lossie 68″ – To Lossiemouth. 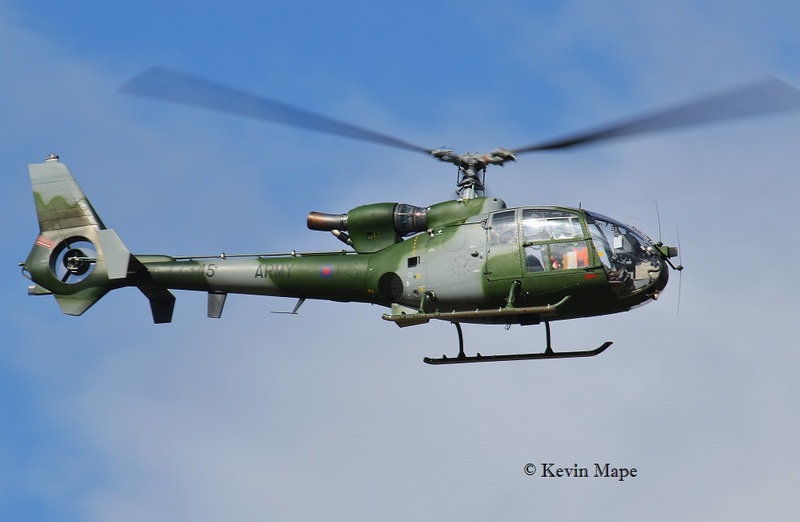 ZB691/7Reg/Gazelle AH1 c/s ” Army Air 843″ – Departed. 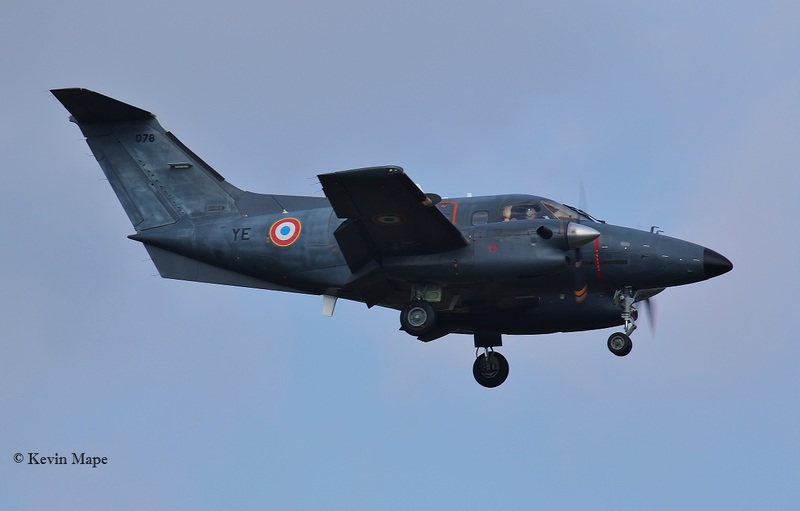 ZH106/06/8sq special/Sentry AEW1 c/s “NATO 35” – Overshoot then land. (1st) ZK333/FS/1(F)Sqn – Engine runs on the ASP. 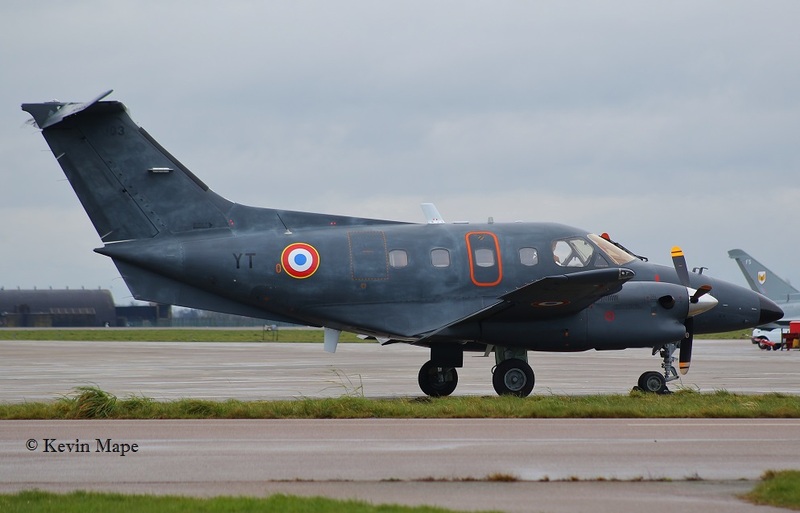 (3rd) ZK313/Unmarked – f/n towed from paint shop to TMF. ex W II(AC)Sqn. (8th) ZJ944/F/1435 Flt – Towed into paint shop about 9-00pm. (14th) ZJ944/Unmarked – f/n -Towed out of the paint shop. (10th) ZK369/Unmarked – Noted on the ASP. (10th) ZJ929/DL/11(F)Sqn – Towed to TMF. (14th) ZJ929/DL 11(F)Sqn – Noted in the paint shop. 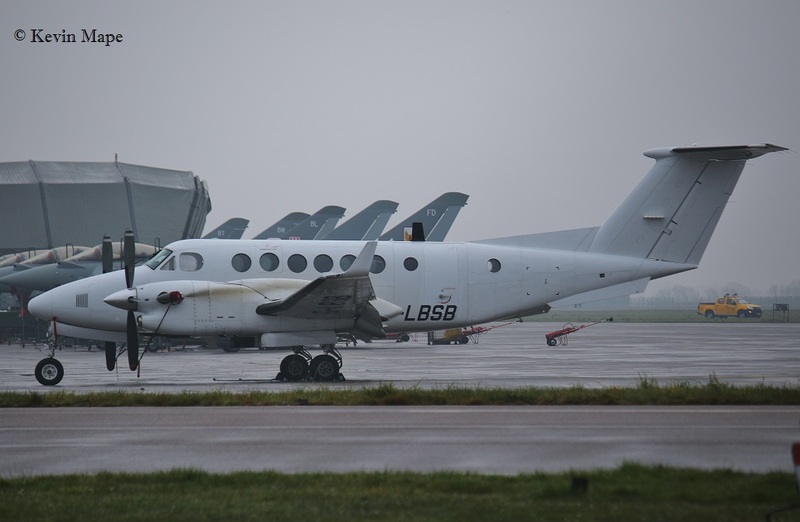 (10th) ZJ939/QO-R/3(F)Sqn – Towed to the ASP. (15th) ZJ931/DA 11(F)Sqn – Towed oto the ASP. (15th) ZK379/BB 29(R)Sqn – Towed to the ASP.